North Andover, Mass. – As Josh Becker goes, so too go the Burlington Red Devils. Putting forth another superb performance on the mound, Becker was dominant in Burlington's 2-0, eight-inning victory over North Andover in the first round of Division 2 North tournament on Thursday afternoon at North Andover High School. Mixing his fastball and off-speed pitches well, Becker held No. 7 North Andover (14-7) to just five hits while striking out seven. The right-hander now has an 8-1 record with six shutouts. The No. 10 Red Devils (14-7) now advance to the quarterfinal on Monday. North Andover junior ace Sebastian Keane (CG, 1 H, 3 BB, 15 Ks) matched Becker pitch-for-pitch. 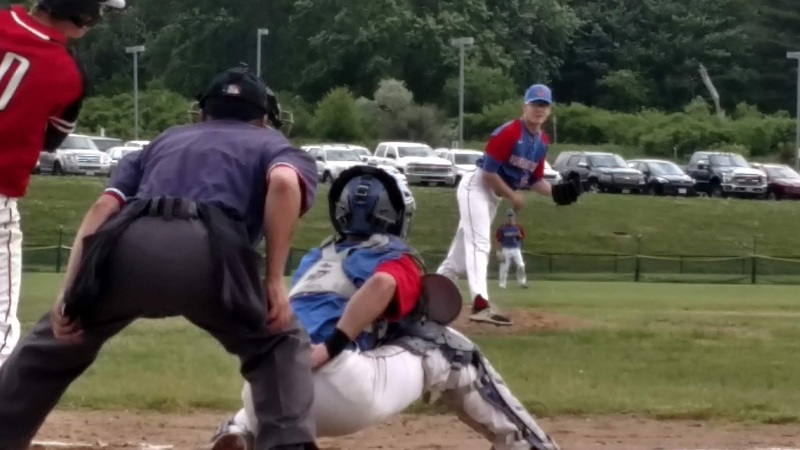 The hard-throwing Northeastern commit was equally in control of things, managing to come away unscathed after Burlington loaded the bases in the third and fifth innings. But with his pitch count rising, Keane was done after seven innings. He departed having allowing only one hit and fanning 15. The Red Devils took full advantage of getting into the Scarlet Knights' bullpen. John Ghio walked and Matt Tyman singled to begin the inning. Justin Miksensas next laid down a bunt to the right side that was fielded by first baseman Justin Connolly. Connolly elected to try and get the force at third, but the ball sailed down the third base line brining home Ghio with the first run of the game. Moments later, Ryan O'Halloran blooped a single into right field which plated pinch-runner Jake McCauley to put the Red Devils on top 2-0 in the top of the eighth. In the bottom of frame, a two-out single by Jake McElroy gave the Scarlet Knights a glimmer of hope. Becker, however got Keane to fly out to finish off the complete game shtout. Both Becker and Keane were nothing short of impressive as their pitcher's duel became the story. With the game moving briskly along, neither club managed to mount any kind of threat over the first two innings. The Red Devils, however, threatened in the third. They juiced the bases with two outs thanks to a single and two walks, but Keane danced out of danger by striking out Ghio. Burlington mustered another offensive charge two innings later. With one out, Francesco Bonanno reached on an error and Jeff Russo walked. Another fielding miscueon Alex Stamides' ground ball loaded the bases. But Keane never blinked as he retired Sean Casey and Ghio in succession to keep the game scoreless. For the first time, North Andover finally got to Becker in the bottom half of the fifth. Jack Morin reached on an infield single and pinch-runner Brian Vazza stole second before moving over to third on Anthony Sapienza's sacrifice bunt. Derek Finn followed with a strike out that was dropped by Russo behind the plate. The senior threw Finn out at first. Vazza attempted to break for the plate before putting the breaks on. Stuck halfway between home and third, Vazza elected to put on the after-burners and race towards the plate. But Tyman at first base alertly threw back to home where Vazza was tagged out by Russo to end the inning. "This was a tough one,'' said North Andover coach Todd Dulin. "But their pitcher was great today. Sebastian also pitched great. But some errors and walking the No. 9 batter three times will always drive up the pitch count. Overall, this was a very good group to coach. We will definitely miss the seniors."